Watching fireworks shot from rooftops at multiple casinos and hotels is an annual tradition of celebrating New Year in Las Vegas. However, during 2008 and 2009, fireworks were banned from rooftops because of a rooftop fire caused by a welding accident at the Monte Carlo on January 25, 2008. As a result, 2009 New Year's Fireworks were set off at ground level on January 1, 2009. After poor reviews from visitors, fireworks returned to rooftops on January 1, 2010 with increased safety precautions. 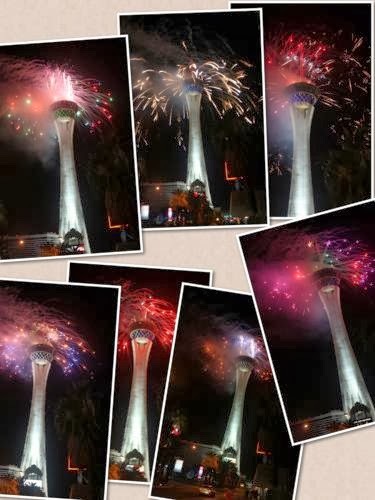 Postcard US-2133896 to Germany shows the 2013 fireworks at Stratosphere on New Year's Day. This morning I was at Mirage where fireworks from Treasure Island and The Venetian could be seen at the same time. I will see whether I got some good pictures to make postcards.